Like many people I'm not the most spritly person in the morning ( in fact I'm terrible! Don't even think about talking to me until I've had at least one cup of coffee!) . 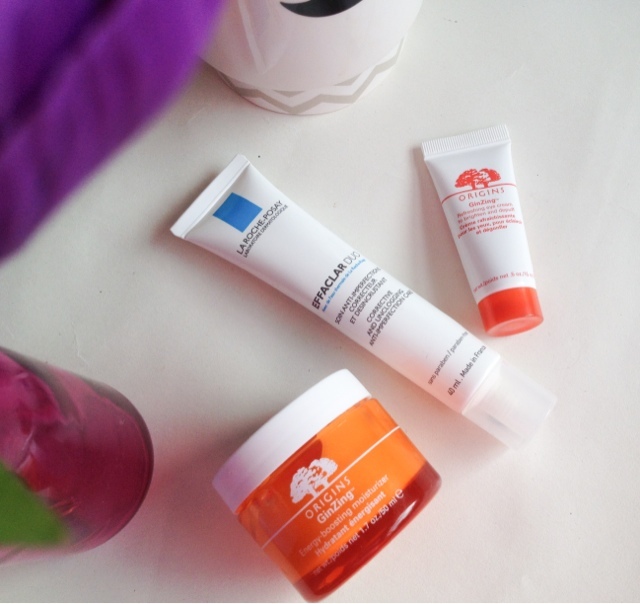 I have adapted my skincare routine around this, using products that are quick and effective. I haven't got hours to spend cleansing my face or to apply numerous lotions and potions, so I use the products that work and cut out any that I feel don't benefit my skin. First up is Cleansing and "Toning". I use the word toning loosely as its not the same as it was years ago. Toners are there now not just to remove the residue of your cleanser but to exfoliate, soothe and restore the natural pH balance of your skin. 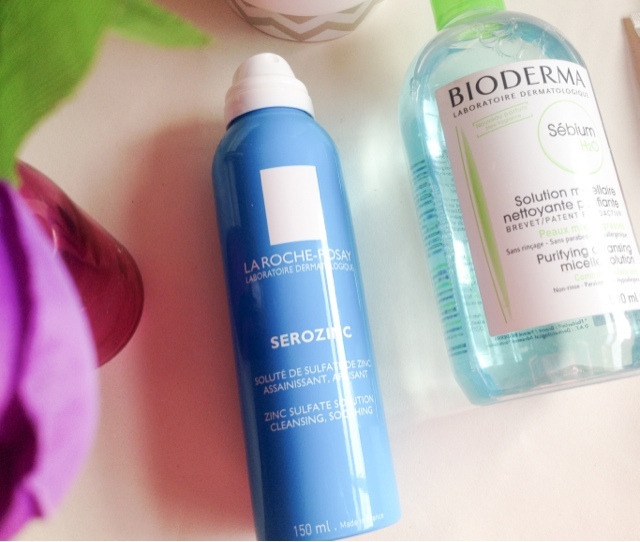 Once I've cleansed my skin I then go in and spritz my face with La Roche Posay's Serozinc. This zinc based solution is again great for oily skin, cleansing and soothing any problem areas in a flash. It leaves the skin feeling refreshed and awakened.....something I definitely need in the morning! When I've finished cleansing I pop on some products which are light and easily absorbed, not leaving my skin greasy or over loaded. First up is La Roche Posay's Effaclar Duo, a light serum which delivers a bit of moisture. Its main job is to de-clog pores and help congested areas, an holy grail lotion in the fight against blemishes and spots for me. As a day moisturiser I've been using Origins GinZing, a light and gel like cream enriched with Gin sing and coffee beans to wake up the skin. I really like this, I find it delivers just the right amount of hydration without leaving my skin feeling greasy, it absorbs really quickly and gives my skin a slight boost.. another bonus in the mornings. Lastly I apply an eye cream, another Origins product, GinZing eye cream. This, like the moisturiser contains the same active ingredients caffeine and ginseng to help de-puff and awaken the under eye area. The cream is light and has a pinky iridescent sheen to it which is meant to brighten and highlight the under eye area. It sinks in quickly and works well under my Bobbi Brown Corrector. I have found I can apply and do all these steps in under 5 minutes, leaving my skin feeling fresh, clean and ready for my make up, or for applying my "slap" (as my husband likes to call it!) These and my coffee leave me feeling a bit more lively and ready to face the day.... well almost anyway! What products are part of your morning routine? Anything I should be try? 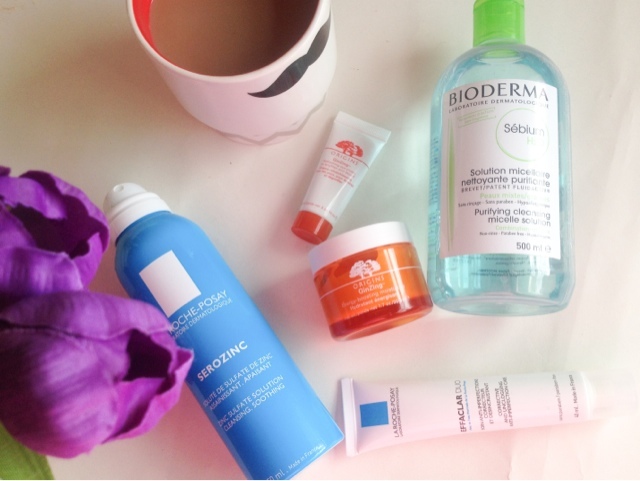 I love reading morning / evening skincare posts, I always like to see if I am using similar things or if I am forgetting to use something important! This little selection sounds very quick and refreshing! I have heard lots about the GinZing range by Origins but haven't tried any of it myself yet - but I love Origins as a brand so I will hopefully pick this moisturiser up soon.